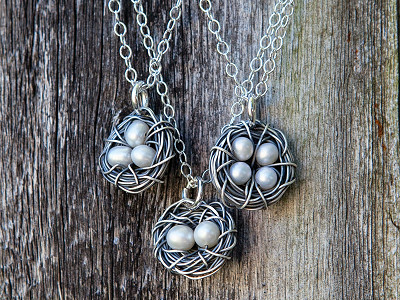 Moms and grandmoms can show that their loved ones are always close to their heart, with handcrafted necklaces from Vintage Pearl. Meant to be personal, these necklaces can be customized to reflect how many kids or grandkids are in her family. Each child is represented by a luminous freshwater pearl. 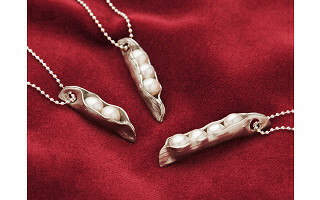 The pearls are set as “peas” in a hand sculpted pewter pod or "eggs" in an antique sterling silver nest. The designs are suspended from an 18-inch sterling silver ball chain, and it’s all Made in the USA. It wasn’t long ago that Founder Erin Edwards had no idea how to make jewelry. She was a stay-at-home mom in Tulsa, Oklahoma, with four beautiful children, and no formal art training. Deciding she needed a creative outlet, she turned to the internet, learning all she could about jewelry making. 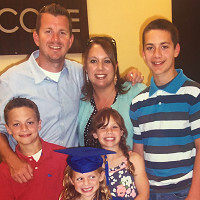 Pretty soon, she was in business, creating pieces for a growing market of eager buyers, all while still getting to stay at home with her kids. Word got out fast, though. Within three years, Erin opened The Vintage Pearl’s first retail store. There are two now, and her company, still based in Tulsa, employs locals, ensuring that all of The Vintage Pearl's items, are handcrafted in the USA. Hello everyone! I'm proud to present our The Vintage Pearl to The Grommet today. I'd be happy to answer any questions you have. they look beautiful, however I have 6 grandchildren. what to do? @Stephanie I'm so sorry but we are only able to fit 5 pearls in our pods. Hi Stephanie, one solution is getting two necklaces to add up to six! Stephanie, you might like our Mother of Pearl necklace as well. It can fit multiple names and is stunning! Contact The Grommet Community Experience team here to see more options. I'm very lucky and have 7 grandchildren. Is it possible to get the pea pod with 7 pearls? Debbie, I'm sorry but we are only able to fit up to 5 in each pod. You could order two necklaces to add up to seven. Debbie, We do offer other necklaces that may suit you better. We offer a wide variety of custom pieces for every size of family. Contact The Grommet Community Experience team here to see more. Heather - can you tell me how the pearls are secured? I absolutely love this product but want to make sure it's rugged enough. :) I have a 10month old (and a 6 and 4 year old) and I'm very active and like to wear my jewelry on more than just special occasions. @Lynda We ensure the pearls are secured so that even with 2 children and being active this piece is one that will last! Can one of the pearls be a different color? @Maria no, we only use the freshwater pearls in this piece. Freshwater pearls come in a variety of different colors, so to say that you can't have different colors because they only use freshwater pearls is inaccurate. I have personally seen red and blue freshwater pearls, though I know there are more colors, it's just a matter of getting the right supplier. Lisabel, I'm so sorry. I should have said we only use the traditional white freshwater pearl. I only have one child & I'm not sure how it would look with only one; can you even do only one? Kathy, Yes, we have 1 pea in a pod. I personally think it's adorable. You can click on the photo above to see how cute it is. Would it be possible to do two pearls of one color and a third of a different color? I have a friend who lost a child and I'd like to recognize all of her children in a piece. Pardon my repetition, I've only just thoroughly read the above comments. Carli, I'm so sorry to hear that your friend lost a child. 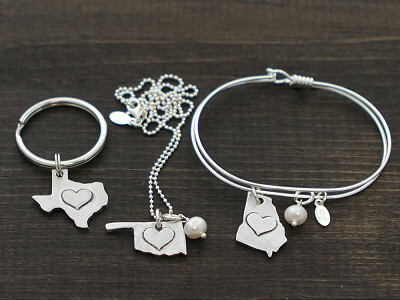 I would suggest adding one of our small heart charms from our a la carte page. Contact The Grommet Community Experience team here to see more options. I tried to order "2 peas" out of stock. When (if) will you have more? Wait list? Mary, there should be more available for purchase soon. Please check back soon! I am trying to order the necklace with 5 pearls and I am unable to. Can you let me know what I need to do? Emilee, there should be more available for purchase soon. Please check back! Hi everyone, wow that was fast! We are in the process of ordering more as I type this. They should be available for purchase soon. We will keep you posted! I'd like to order some as gifts but some of my friends/family have children who are older (like late teens, early twenties, etc.) Would this be appropriate? Kathy, I think it would absolutely be appropriate. 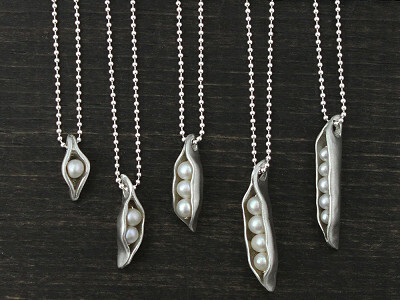 Our pieces timeless and some teens even buy the two peas in a pod for themselves and their best friends. Hi Kim, if you check back in the next day or two they should be available! these look beautiful. Personally, i don't like peas - they get stuck in my teeth but can certainly understand the affinity of many people for peas. I do like pea soup (doesn't get stuck in my teeth). The Emeril pea soup recipe with hot dogs is one of my favorites. Do cut the hot dogs in quarters - we all know the stories about people choking no hot dogs. It is very serious. I have two half-step grand children and three of my own. Normally i would order the five in the same pod - but my step daughter can certainly get a bee in her bonnet. I thought it i had just a half pea, it could keep her from becoming Ms Grumpy Pants. Can i order half peas? I don't mind paying full price. Susan, I understand. Thank you for the recipe! I may have to try that next week! I'm so sorry but we do not offer half peas. I tried to order the 5 peas in a pod and my only options are the single pearl. Are they out of stock? Helen, there should be more available for purchase soon. Please check back! I had terrible dealings with this company last mothers day. I messed up my order & never was able to get hold of a real person to help fix it and I was out $44 for one whole gift. The other thing is that the chains are very short and not very sturdy. An adorable thought but not well done by the company in my opinion. Mary, I'm so sorry that you encountered a problem last Mother's Day. We do offer multiple sizes of chains and have a chain guarantee. We would be happy to work with you and solve any problems that you had. Please email our customer service or give us a call. @Heather I am trying to order a one, two, and three. I can't find the two and three?!? Rebecca, there should be more available for purchase soon. Please check back! 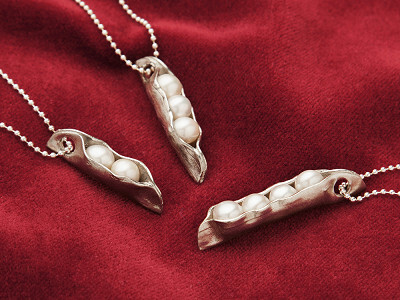 Hi everyone, because everyone is in love with The Vintage Pearl necklaces, we have expedited shipping on all products. You can now order in every variety buy clicking the "buy" button above. Orders for the 4 or 5 pearl necklaces will ship on April 20th. 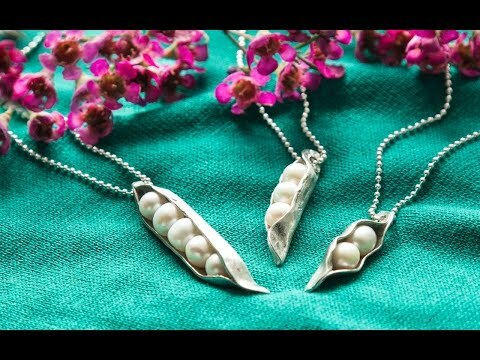 Orders for the 1, 2 or 3 pearl necklaces will ship on April 27th!